There is no shortage of fun and exciting changes happening in the craft beer industry these days. Without this blog post, most of you would never even know that behind the scenes of our everyday activities, we have been going through one of the biggest changes in the history of our company. For a significant amount of the areas where our craft beer is sold, we are in the middle of a distribution change. This will result in new faces selling our beers on the streets of areas like Orlando, St. Augustine, Jacksonville and the Panhandle. What does this mean exactly? Well, for most of you it is a change that you won’t even see. You will still see our draft lines at your favorite watering holes and our cans on the shelves of the areas where we are selling our craft beer in cans. If you are a bar, restaurant or another establishment that used to buy our craft beer in any of the Orlando, St. Augustine, Jacksonville or Panhandle areas, you will now have a new smiling face to buy our craft beer from. All of this is detailed out in the map below and should tell you exactly who to place your orders with. 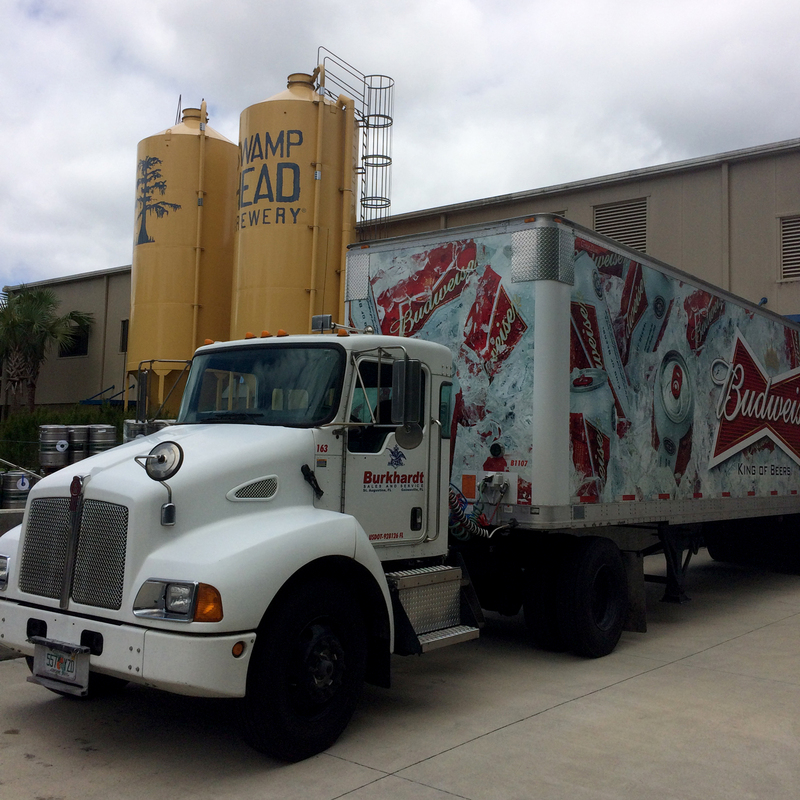 NOTE: Cone Distributing remains our distributor in Gainesville, Ocala and Tallahassee. These areas will not be affected. Although change is always a challenge, we are excited about the new opportunities that are headed our way. Our new partners are ecstatic to be selling our tasty brews. 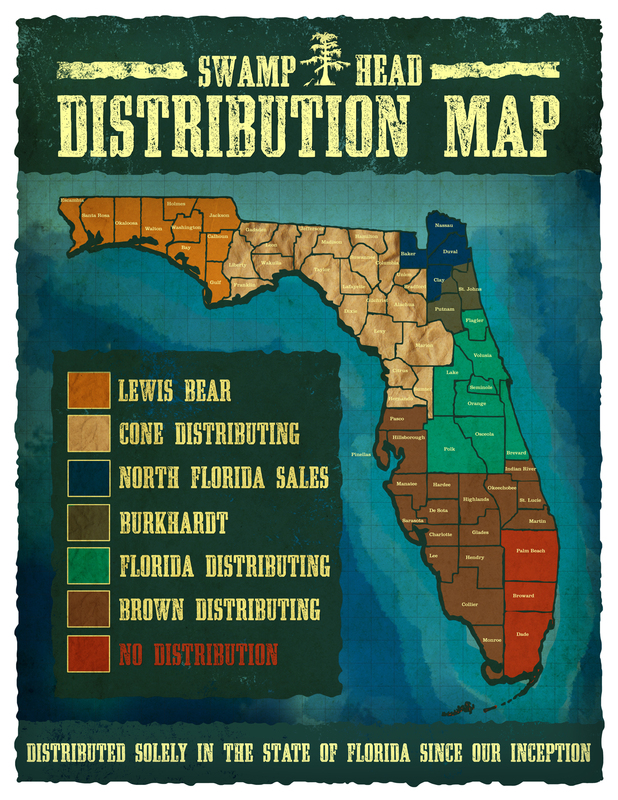 Take a look at the new distribution of Swamp Head goodies, and let us know if you have any questions about any of it. Brown Distributing: Until the above dates, Brown Distributing will cover all distribution outside of Cone Distributing’s territory. After, they will cover only the areas shaded in brown. We owe all of our new distribution partners a big pat on the back for their help and support in getting our team up and running with their companies. We’re looking forward to long relationships focused on top notch customer service and spreading the Swamp Head love to all of our favorite Floridians. Cheers!